You must experience this home in person to fully grasp the scope of Southern California coastal living! 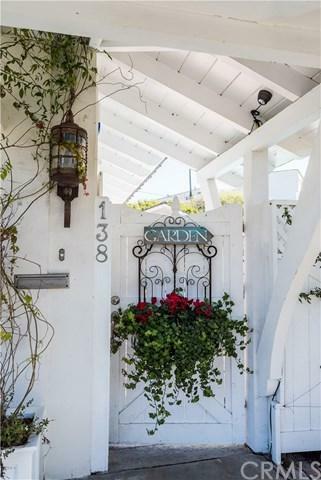 138 Paseo De Gracia+GGs front dutch door welcomes you home and allows the beach breeze to gently flow thru the house. The beautiful & welcoming vibe feels like living in a vacation 365 days a year. The open floor plan & easy flow make this absolutely perfect for entertaining for years to come. The attached 2 car garage has been transformed into a pool side game room which has quaint barn doors that open directly on to the interior court yard and pool attracting endless hours of summer fun. Every space in the home oozes charm, light, warmth and fun! The airy kitchen equipped with a large island in the middle, Viking 6-burner stove and sub-zero fridge overlook the pool and patio. The ample dining room with fireplace and mantle is stunning and will be a dramatic back drop to every meal and gathering. The huge master suite with master bath, hold a massive claw foot tub and, double granite vanity. It also has a walk-in closet that is amazingly spacious and organized, allowing the master suite to be luxurious, private and accommodating. The family room is warm and inviting with double sided fire place to the dining room and has access to the private back yard with vine covered pergola and detached guest house. Within walking distance to the Riviera Village, local beaches, neighborhood parks, and award-winning schools this home embodies beach living. Sold by Kathryn Lane of Kathryn Lane, Broker.